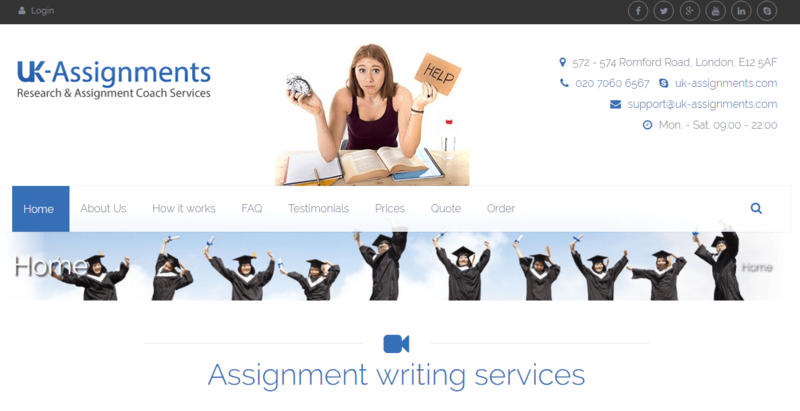 Because there are some people out there who try to scam desperate students, I decided to review essay writing services so future students know which services it’s safe to trust, and which aren’t legit. UK-Assignments.com offers custom essays, so I looked into them. The first thing you notice about this website is that they offer a full address as well as a contact number and email address, which makes them seem really trustworthy. There are also social media links, so this looks reliable, however, when I clicked on their Facebook link, the page wasn’t available. So now I’m not sure if any of their contact details are actually real, which would make getting support or a refund really difficult. When you order, you automatically provide login details and register for an account. However, you don’t need to provide these details for a quote. You just enter details like the length of your paper, what academic level you’re at, and your subject. You don’t have an option to select the kind of grade you want though, and they don’t provide any guarantees. At £260.41 for a 3000-word literature paper, this is not the best deal. This is especially true when you realise you have to pay more for a summary or conclusion, appendices, or a plan. You even pay more for a plagiarism check report, when I feel they should guarantee originality. You may be able to save a little with a discount coupon or if they run some kind of promo, but otherwise this is very pricey. UK-Assignments.com states that all of their writers have a PhD or Masters in their chosen fields, and all are native English speakers. However, I’m not convinced that this is the whole story, as they offer to write custom papers for hundreds of subjects, and they’d need a huge staff to have experts in every field. There are no samples available, which is a shame as I like to see an example of the work they provide, however, there are some testimonials. These are really short, really vague, and also very dated, so I don’t really want to rely on them. Overall, I wouldn’t want to place any trust in UK Assignments as while they look great, a lot of their website seems to be a façade. If there social media profiles aren’t real, then there’s no reason to believe that their address and phone number are either, which makes me doubt their assertions that they only hire qualified writers. There’s also a lack of recent testimonials, so this is a website I’d avoid.